Two rare busts rescued from the Islamic State group in the ancient city of Palmyra and restored in Italy have been returned to Syria, the country's antiquities director said. DAMASCUS: Two rare busts rescued from the Islamic State group in the ancient city of Palmyra and restored in Italy have been returned to Syria, the country's antiquities director said Wednesday. "The two statues were returned to Syria on Tuesday and added to the 400 artefacts that were rescued from Palmyra," Maamun Abdul Karim told AFP. IS jihadists seized Palmyra in May 2015 and began to systematically destroy the city's monuments and temples, while also looting its many archeological treasures. They were driven out in March 2016 but recaptured the town last December. Recovered by Syrian troops, the two funeral busts had been badly disfigured with what appeared to be hammer blows. They are perhaps the only such artefacts to have left the desert site without being stolen. Modern technology was used in their restoration, which is also being hailed as a tribute to Khaled al-Assad, former head of antiquities at Palmyra who was murdered by IS in 2015 at the age of 82. AFP reporters saw the two statues -- one of a woman and the other of a man -- being transported from the Damascus museum to an undisclosed location on Wednesday. 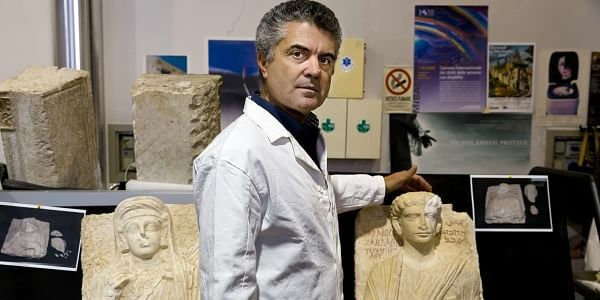 Abdul Karim said the restoration of the busts "is the first real, visible positive step that the international community has taken to protect Syrian heritage". "This is part of cultural diplomacy, which does not prevent coordination among the people of different countries to combat extremism and barbarism," Abdul Karim said. "In the end, Syrian heritage is human heritage," he told AFP. The busts date to the second and third centuries and were transferred to Rome via Lebanon. A team of five specialists worked on the restorations for a month, focusing in particular on the faces. On one, the upper part of the face had been destroyed, but the team managed to recreate the missing portion using a synthetic nylon powder and a 3-D printer, a technique that had never been used for such a restoration. The new piece was attached to the bust with powerful magnets, "which makes it completely removable, in line with the principle that all restoration work must be completely reversible", said Antonio Iaccarino, one of the restorers. "What the Islamic State has destroyed, we have rebuilt," he said. "Through culture, we also wage an ideological battle."